This popular choice of holiday home has massively progressed over the years to become the number one choice for people in the UK. They are no longer just a basic getaway for people on lower incomes, but a luxury getaway a variety of people can enjoy. Static caravans can feature double glazing & central heating as well as washing machines, fridge freezers and dishwashers. This makes for an easier more enjoyable holiday away from the comforts of home. Static caravan manufacturers generally have their own methods of building which is unique to them. A steel chassis is the starting point for a static caravan. The Chassis can come galvanised, sometimes as standard. A galvanised chassis will last longer than a bare steel chassis and is recommended if your caravan is by the sea. The floor is laid with a timber framed insulated panel. This is followed by the sides, which are built with bonded composite panels containing the insulation. Once all panels are in and joined together the caravan has an overall structure and is starting to take shape. The cladding is then applied to the outside which can be aluminium panels, canexel or even timber panels. To give doors and windows stability sometimes steel frames can be used. A static caravan is designed to withstand severe weather conditions. After the insulated roof system is installed, the roof tile system, as well as exterior gutters and downpipes are built on. This completes the basic structure of the static caravan. Manufacturers use trained professionals to fit out the kitchens, bedrooms and bathrooms. The final stages include laying carpets and applying the finishing touches throughout the static caravan. The static caravan would then go through quality control checks before it leaves the factory. You will find static caravans on most parks in the UK. This is due to the variation of sizes and models available to suit most budget ranges. Are static caravans designed to use all year round? Higher insulation levels will help you to manage your utilities better. The superior acoustic performance means you will hear less outside noise and enjoy greater privacy. Higher heating performance as BS3632 stipulates that A graded appliances are to be installed. The ventilation in residential grades must also be higher in BS3632. This can mean improved air quality flowing through your holiday home. Static caravans are brilliant as they come in a range of makes and model. You are sure to find a static caravan which suits your needs. Own your own static caravan from only £30,000. 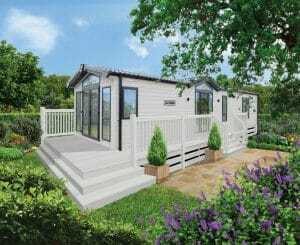 This really is fantastic value to own your own holiday home in the UK. Start your search today with Parklink. Click here to view our range for static caravans for sale.